New Home Star runs inspiring initiative to celebrate builder partners from July 24 to 28. New Home Star's INW Washington Sales Team at fundraising event benefiting the homeless youth. It’s incredible how the NHS Builder Appreciation Week helps our region really come together and reinforce a team atmosphere. Last summer, New Home Star kickstarted their first inaugural Builder Appreciation Week, during which over 300 sales professionals nationwide showed their utmost gratitude to the homebuilders that partner alongside their organization. 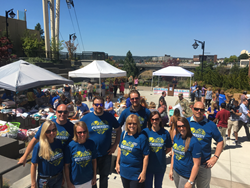 This year, the firm upped the ante to further relay their appreciation through a multi-tier event recognizing everyone from the construction crews to the office staff, as well as the community in which they serve. Dozens of stories were shared, detailing all of the amazing memories made and the unique initiatives that so many undertook to strengthen the relationships with the men and women who work each day to make the American Dream possible for buyers everywhere. New Home Star made Builder Appreciation Week one to remember, and the firm anticipates repeating this initiative for years to come. Explore the photos and stories from Builder Appreciation Week on our Facebook page. New Home Star is a national real estate sales management firm serving homebuilders and developers across North America. They recruit, select and develop sales teams with a full-time focus on new home sales, working with some of the largest homebuilders in the U.S. and Canada, as well as small and mid-size companies. With a network of local sales divisions from coast to coast, New Home Star delivers sales solutions for businesses with a national perspective and a local presence. Their business goal is simple: To Sell More Homes More Profitably™. For the latest updates on new home sales, follow @newhomestar.